In ancient Egypt there were many mutually exclusive myths of creation, because from each of these very different explanations of the beginning of life a unique and valuable lesson could be learned that would enrich life in the present. Within every human culture a battle rages between the conflicting notions that knowledge and truth are static concepts to be achieved and protected against the threat posed by change and the notion that knowledge and truth by their very nature are ideas that one never achieves but rather an endless process of thesis, antithesis, and synthesis as a necessity of maintaining human viability in adaptation to an ever changing reality. In the language wars, there are those that see America as English speaking and can even support this view by pointing to the rest of the world buying into the notion of American exceptionalism -- by rewarding our failure to learn other peoples languages and cultures by learning ours. And then, of course, there is the reality of what has in fact created American exceptionalism, which is the willingness to freely incorporate into our definition of what it is to be an American the often different and rich perceptions and historic experiences of the never ending waves of immigrants that are America. It is a difficult balance to strike between a monolingual English language based American culture and a willingness to acknowledge that our edge in the world comes from a willingness to constantly allow this linguistic tradition to morph into something new and more adapted to the changes that are a fact of human life, whether we choose to acknowledge it or not. There was a time when French was the lingua franca of the world, but in observing French society we realize that its decline as a world culture had a great deal to do with the fact that they defined their language as immutable to the changes that American English has been willing to accept. It is my belief that we have arrived at a crossroads in this country and more specifically in California where we must take the next step in cultural literacy, which means the acknowledgment of the fact that we as American stand to gain much more from speaking Spanish or other languages as opposed to insisting on the enshrinement of English as the only language with which the pragmatic American approach to life can be expressed. 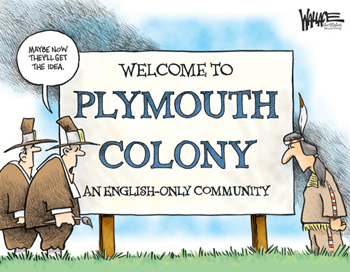 While in the past the cost of becoming an American has been for the immigrant to this country to give up their native language, using a risk vs. utility argument, I would now assert that we stand to gain much more by becoming a multilingual society than we do by remain English only. However, let me be perfectly clear about the fact that I in no way seek to challenge the hegemony of proper English nor do I think that the acquisition of other languages would in any way do this. In fact, the recognition of Spanish as the cultural and linguistic source for the majority of the people in this state would strengthen both the mastery of English and Spanish as bilingualism has done in virtually every culture where it is allowed to flourish, because it builds into our educational process the nuances of creative difference that are expressed in different languages that are the prerequisite for creating a new way of looking at things that tends to elude an insular monolingual culture. In light of the continuing problems that we experience in educating English Language Learners, it is important to note that a country like Sweden has 100% literacy in both Swedish and exceptionally high levels of literacy in English and other languages. This has not compromised the culture or national character of Sweden. In Holland and Denmark, the BBC has been part of their public media since WWII and yet these people do not see the acquisition of English as a threat to the hegemony of their own national linguistic tradition. Probably the best example of American inspired bilingualism is the Philippines where American missionaries and educators after the Spanish-American War adapted a tradition American system of public education so that educated Filipinos are equally fluent in Tagalog or their other native tongue and English, since they have taken courses throughout their schooling in both languages. How much of the English only mentality in this country has to do with the human tendency toward laziness, where we enshrine what we know as a desperate defense against having to continue thinking and mustering the energy to learn something new. Can any of us honestly say that the addition of a second language to their knowledge would be a negative? At 63, it is my greatest task, like it is the task of this country, in remaining viable for as long as we can in the ultimately futile fight against entropy to continue expanding my knowledge of what I don't know and those who are different than myself. To that end, I plan on spending 2 months this summer at the Habla Ya Spanish Language School in Boquete, Chiriqui, Panama. My expression of American exceptionalism is in defying the entropy that has consumed previous cultures for as long as we can. At the very least, I should be able to find some new sources for public education reform topics from Central America to share with you during the summer.